Investors doubled down on the market rally, sending the Dow and S&P 500 to new highs after Friday's October employment situation report showed that the unemployment rate dropped again. For the week, the S&P 500 gained 0.69%, the Dow leapt 1.05%, and the Nasdaq added 0.05%. The October jobs report buoyed hopes about the labor market by showing that job growth increased at a steady rate last month, adding 214,000 new jobs to the economy. The unemployment rate fell to a fresh six-year low, edging down to 5.8%. In terms of overall gains, the labor market has added over 200,000 new jobs a month for the last nine, the longest span of such gains since 1995. However, many Americans are still feeling anxious about the economic recovery and their prospects. Exit polls from Tuesday's elections showed that nearly 60% of voters felt that the economy was stuck in neutral or even going in reverse. Why? Some economists (including Federal Reserve Chair Janet Yellen) point to stagnant wage growth. 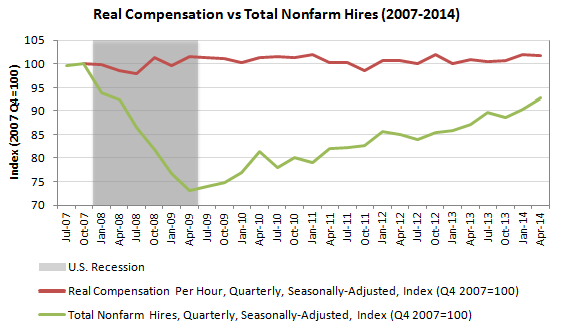 Taking a look at the chart below, we see that while hiring has increased since the bottom of the recession, real compensation (adjusted for inflation) has remained fairly flat. While the economy is undoubtedly doing better, many Americans haven't seen those gains reflected in their paychecks or career prospects. Source: Federal Reserve Economic Data, U.S. Department of Labor, National Bureau of Economic Research. Most of the job gains in October came from the retail and food service sectors, which are not the well-paying jobs that we want to see. Much of that can be attributed to a pre-holiday staffing surge from restaurants and retailers who expect a solid holiday shopping season. Are good jobs coming back? Yes, albeit slowly. One economist estimates that 34% of jobs gained in the third quarter of 2014 were in mid-paying industries as compared with just 21% a year ago. On the other end of the spectrum, low-paying jobs made up 39% of new jobs, as compared to 66% last year. October's auto sales report also came out last week and showed investors a couple of important things: Auto sales are booming, up significantly since last year; average sale price is also up, gaining nearly 3% since October 2013; even better, price gains are outstripping incentives, meaning that car makers are able to offer fewer incentives to buyers, which is great news for firm profit margins. Why do we care about vehicle sales? We can treat big-ticket sales like autos as a broad proxy for overall consumer spending; generally speaking, when Americans feel well off enough to buy a new car, they are probably spending well in other areas. Next week's calendar is light on economic data and earnings season is largely over. With markets at new historical highs, it'll take some pretty good news to keep buying pressure up. With a slow week ahead, it wouldn't be surprising for investors to want to take some profits off the table and wait for more economic indicators. Analysts will be looking for Friday's retail sales report to contextualize the surge in retail hiring. If strong shopping trends support the job growth, it may show that retailers are on track for a solid holiday season. If not, investors may worry that retailers will be hurt by high costs. Oil price slump could affect shale oil industry. While plummeting oil prices puts money in consumers' wallets, it could also undermine the production of domestic shale oil, which is only economically feasible with oil prices above $80/barrel. Factory goods orders slide in September. New orders for U.S. factory goods fell for the second month in a row in September, underscoring worries about global growth. On the other hand, unfilled orders rose, indicating that October could be a better month. Trade deficit widens in September. The difference between U.S. imports and exports increased as exports fell, highlighting concerns that slow global growth and a strong dollar could undermine U.S. trade. Construction spending falls in September. Construction outlays fell unexpectedly as private construction fell to its lowest level since October 2013. While construction numbers can be volatile, slower building could indicate a lack of business confidence in the economy.